The age-old adage is true, location is everything. The beauty of small town living is that you are close to delicious restaurants, grocery stores, retail shops, and medical services. Not only do you get to enjoy the quaintness of the mountains, but a quick run into town will provide you with city conveniences. 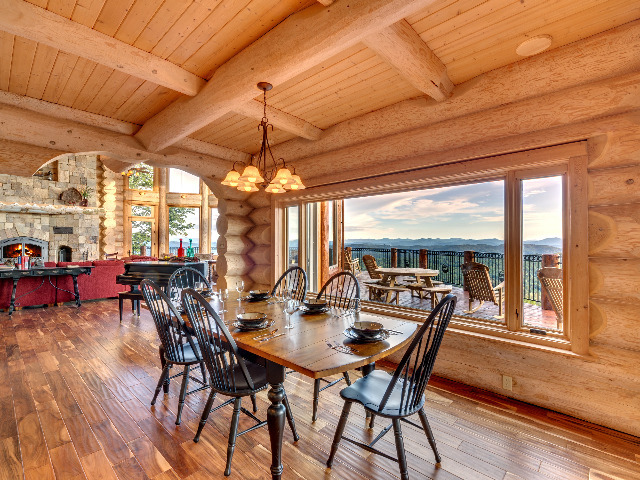 When looking for a mountain home, you want to be sure that you will be able to receive cellular reception and high-speed internet. Wi-Fi is a definite necessity for our smart tv’s and smart homes offering conveniences and security features for this day and age. Many North Georgia communities are now part of the North Georgia Network which provides a state-of-the-art fiber-optic network offering high-speed broadband. Bring the outdoors in with large windows and tons of natural lighting. Not only will this lift your spirits, but you’ll be more active and able to get more tasks accomplished. Not to mention that as we age, it becomes more difficult to see so the lighter the better! Task lighting, dimmable switches, and ambient lighting are also considerations for lighting your new home. 4. No fuss, no stress! Now that you’ve retired in style, who wants to spend all their time fussing with maintaining your home’s exterior and landscaping? Look for homes with vinyl or brick siding to ensure minimal upkeep. Consider a metal roof. Not only are they low maintenance, but you’ll love the sound of the rain coming down! Wooded lots are ideal options to keep your outdoor workload light. If you do have large grassy areas, consider removing it by paving, graveling or adding a deck to the space. If you were to ask our knees and hips if they want to walk up and down stairs to get to and from the bedroom, they would give you a resounding no! Search for homes with master bedrooms on the main floor to keep those aches to a minimum. While single story living is most desirable, multi-levels work great as long as the master is on the main and your guest rooms are upstairs! As we mature, traditional tubs become cumbersome to step into and can be dangerous when getting out. Look for walk-in showers with no step or a small step to reduce the risks of slipping. Fortunately, walk-in showers are easier to clean and they look great too! 7. Take it for granite! Yes, we really meant granite! Granite countertops are the ideal hard surface countertops. Easy to clean and maintain, these durable counters are resistant to heat, scratches, and stains. Not only do they increase the value of your home, but the earthy look and variety of color options will complement both the rustic and modern home styles. Select energy efficient appliances not just because of the tax break, but because you will reduce your carbon footprint. Energy efficient appliances use less energy, cuts utility costs, and help to protect our environment.